I mentioned on a previous post that I prefer Glidden’s Ultra-Hide 770 semi-gloss paint, formerly called America’s Finest. With other paints, when applying a second coat, the first coat begins to peal back up. This paint has never had that issue for me. 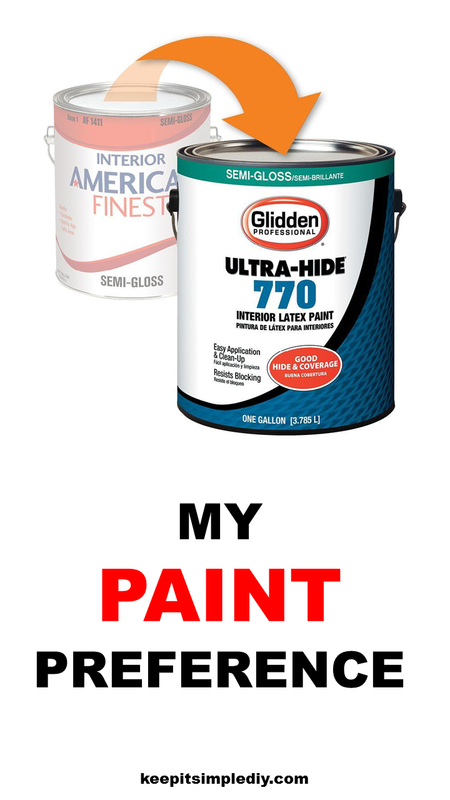 This paint is cheap for gallon size. $18/gallon. With how often I paint, it needs to be cheap. The coverage this paint provides is great! Covering over a similar color only takes one coat and covering over a color outside of the color pallet takes only 2 coats! Unless of course you are painting white over a color. Semi-gloss paint is more reflective than flat paint and brightens up the house. (Tip – put semi-gloss paint on your ceiling to make your space look larger. Semi-gloss paint is easy to wipe clean.